20 miles, Elevation Gain 0ft. Hiking and camping along Shi Shi Beach is supposed to be a nice 15.5-mile experience with stunning coastal views. The views held up, but the easy mileage was an illusion in my mind! The plan was to hike from the Shi Shi Beach trailhead to Cape Alava. Me and my buddy Jose left a car at each end since it was a one-way hike. After deciding we wanted to end with a more scenic campsite, we decided that hiking from Cape Alava and heading north to Shi Shi would be the better option. The trail started along this amazing boardwalk through the typical coastal rainforest found in the Pacific Northwest. The trail to the coast is roughly 3.5-miles, an easy, beautiful stroll that lands you at Cape Alava and a stunning view of the Olympic coastline. We had a tide table with us and knew we would have to time the tides the whole trip to safely pass certain areas of the hike. This timing turned out to be more complicated than we had imagined. On the first leg of the trip, we reached the beach purposely at high tide, knowing that as it went out we would be able to make it all the way up to the Ozette river crossing, which we would reach around low tide. But when we finally reached the river we had to wait about an hour for actual low tide, and even then the river was about knee high, had a pretty swift current, and was freezing cold! We safely crossed the bone-chilling river and continued on our way. Night one we camped at the Seafield Creek campsite and made it just as the sun was setting. It was beautiful. We were expecting to get plastered with rain the entire time, as that’s usually what happens on the Olympic Coast in March, but it was unusually clear and starry. We woke up and planned to be at Point of Arches by 10:30 in the morning, thinking that would give us plenty of time to round the point before the 1:30 high tide hit. The entire stretch around the point is impassable during high tide, and at one part you can’t even get around at low tide, so you have to take an overland trail. After thirty minutes of boulder scrambling we arrived at the final bend in the point before the overland trail. We scrambled over a huge bolder and saw that we didn’t factor in the shape of the point, which stuck farther out than we expected. This meant the tide had already begun to slam into the rocks and there was now no way we were getting past. We knew if we didn’t move quick we were going to be cut off behind us and in front of us — we would be stuck with nowhere to go when the tide came in. We turned around and moved as fast as we could to get to safe ground, but soon found we had indeed been cut off. Luckily we could tell that the stretch ahead of us was only about knee deep. So we took off our boots, rolled up our pants, and got wet! It was freezing and the waves were getting bigger, so we moved as quickly as we could in bare feet across the rocky terrain. We made it safely back to our first night’s campsite, where we built a fire to warm ourselves up and dry out our feet and pants. We waited for low tide, then crossed the river back the way we had come, and camped on the other side for the night. The Point of Arches crossing proved too tough, so we didn’t make it the whole way we originally wanted to go. But we had an adventure that was wild and worthy of remembering. A zippered opening on the front allowed great access to the pack’s main compartment without having to unload everything out of the top. The medium-sized outer pocket on the front of the pack provided a great space for items that you need to access quickly. The two side pockets were large enough and stretchy enough to hold a camera tripod, which is a huge plus for me. The lightweight Cross Rip 280D nylon fabric the pack is made of took a beating and never showed any signs of wear. It is also coated with a DWR finish. The shoulder straps and back panel use Jack Wolfskin’s proprietary X-Transition suspension system. This means the pack will fit almost anyone, as you can seriously adjust the size. The spacious 60 liters holds plenty of gear for a multi night outing, while not having a ton of extra room. The pack is hydration bladder compatible and has a separate sleeping bag compartment. There are separate ice axe and trekking pole fasteners for those who need them. The Jack Wolfskin Highland Trail XT 60L Backpack is best for weekend to week-long get-aways. At 60 liters this pack is spacious and has generous pockets for stashing snacks, tripods, and just about anything you want to take with you. It is surprisingly durable (we scrambled down some sharp scree), and due to the torso adjustments it would work as a pack for a growing teenager or anyone who likes sharing! The external pole system is designed in a way that gives maximum floor space inside the tent. It feels more like a condo than a tent. Storage pockets abound inside the tent for stashing gear that you need to find easily in the middle of the night when nature calls. You can get a gear loft that attaches to the ceiling inside the tent for even more storage. Two large doors on both sides make this tent incredibly easy to get in and out of. Each door has its own spacious vestibule. There’s enough room to store gear out of the weather and for you to exit and enter easily. The Jack Wolfskin Exolight III tent is a dream come true for backpackers in the Pacific Northwest. It’s ideal for wet and raining locations. Since they fly is connected to the tent body and the poles are like an exoskeleton that go on the outside of the tent, it is fairly easy to set up this tent without getting the inside wet. 850-fill down keeps this jacket super lofty and extremely warm. At 11 ounces. this jacket is stupid light for how warm it is. I own a lot of down jackets and this one by far has the best warmth to weight ratio. The inside of the jacket has a generous-sized drop-in pocket on one side and a small pocket on the other. Great for storing basic gear. Durability, extremely well made. Once in hand you can feel that it’s very well built, surprising considering how light it is. No need to be delicate. Hood is spacious, probably would fit over a climbing helmet if necessary. Ideal size for backpacking, even without adjustment points. Threw hood up at night. EVERYONE! Seriously, the Hyperlight Hooded Down Jacket from My Trail Company is my go-to down jacket for warmth now! If you can have a super warm jacket that weighs next to nothing, why wouldn’t you have one? For those who are serious about maximizing the weight to warmth equation, and want to support a small brand. These are made-to-order sleeping bags, and come in multiple temperature and size ranges. Can get a very customized fit for your exact situation. are as good as it gets. Crazy lightweight. My bag was rated to 5 degrees fahrenheit, extra-long, and weighed only 20.8 ounces (one pound, four ounces). This bag is as lofty as a thunder cloud and warm as a tanning bed. Seriously. 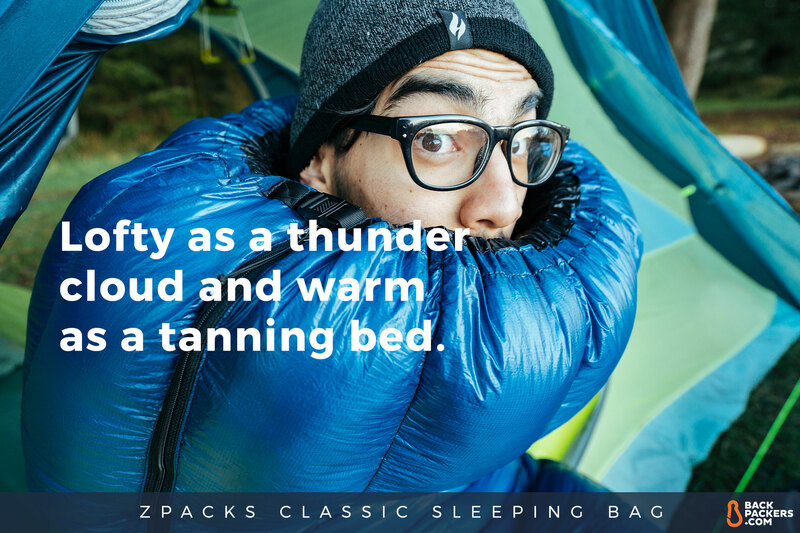 This sleeping bag doesn’t have a hood, but Zpacks recommends getting a longer bag than normal so you can tuck your head inside it. I did this, and it works wonders. Zpacks is all about custom bags, and provides different temperature ratings and sizes to get the exact bag you need. The Classic Sleeping Bag is best for the picky backpacker, who knows the exact climate they’ll be in and how they sleep. Also great for those who want a hybrid between a quilt and a sleeping bag.